Jennifer Harkness is a West Seattle resident and therapist who integrates art therapy, meditation, and other "somatic" disciplines in her practice. She is degreed from the storied college, Naropa, in Boulder, where beat poet Allen Ginsberg once hailed and howled. She holds an ornate box a client created in session to help deal with body image issues. When West Seattle child, adult, family and group psychotherapist Jennifer Harkness works with her clients, you might say she uses art and soul. Her practice, Courageous Heart Healing, LLC, combines traditional talk-therapy techniques with meditation and art, lots of art. "My studio is full of yummy supplies," enthused Harkness, whose practice is located on Harbor Ave SW in the Activspace building. "Chalk pastels, oil pastels, clay, glitter glue, boxes, canvas. People paint masks. Who do they feel like on the inside? My job is to support people in their own process. "I teach them how to use the (art) materials, witness what they create, and we reflect," she said. "I practice a more 'strengths-based' style of validation and support to help people find their own answers and empowerment. I help people talk about their own work," she continued. "I'm not going to 'interpret' their art. It's about the process more than the finished piece." Harkness, born in Kansas, lived in Eugene, Ore. for 12 years. She then earned her undergraduate degree from Naropa University in Contemplative Psychology (Buddhist Psychology) with an emphasis in Expressive Arts and Healing and a minor in Religious Studies, and masters degree at Naropa in Transpersonal Counseling Psychology with an emphasis in Art Therapy. Naropa, in Boulder, Col., has a celebrated past. Founded in the mid-1970's by Chögyam Trungpa, an exiled Tibetan and Oxford scholar, it contains The Jack Kerouac School of Disembodied Poetics founded in 1974 by iconic poets and protestors Allen Ginsberg and Anne Waldman. "For some people, especially when there is a lot of trauma, anxiety or depression, it's really in the body as well as the mind, and they need 'somatic' therapy that also works with the body to help move both your emotional and physical energy as well," Harkness said. "This can help you work through the 'inner critic' and what's going on emotionally. "Some adults have shut down emotionally because others have put them down in the past," she said. "Somewhere along the line someone criticized you and said 'You should drop this and go into something else'. Parents might tell their children, 'Stop taking art classes'. And it was really painful and they've come to me, and now sell their artwork in galleries. It can be that literal. "Or you love to play guitar," she suggested. "OK. Let's talk about what you want to do with it. Even if it's just the joy of playing it in your living room, in a coffee shop, or sitting on the street and playing for people walking by. It's valuable to you and you grow with it. This culture says you have to be famous or make money or something but I don't think that's actually true. I'm an artist but I don't sell my artwork. I'm very fulfilled with making my art." Art therapy is not always that literal, however. For instance, a decorated box or container may symbolize emotions locked up, enclosed. "One of the great metaphors of art therapy is containment," she said. "A lot of time we carry around heavy, challenging thoughts and feelings." She held a small painted box in her palm, decorated on the outer sides with the words "love", "beauty", "integrity" and "courage". 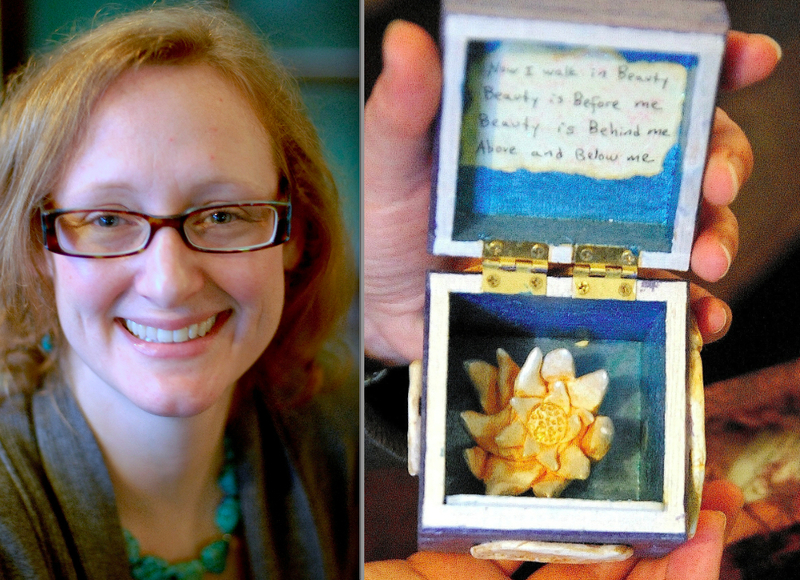 Inside, above a yellow flower, the artist's hand-written poem, "Now I walk in beauty. Beauty is before me. Beauty is behind me, above and below me." Harkness explained, "The box was made by a young woman working through insecurities around self image, body image, pressures she felt in our culture. When you can put your heavy, challenging thoughts in a box metaphorically it can lighten it a bit to allow you to open up and deal with it a little later. Contained in that box is also something tangible. "Veterans coming back from Afghanistan and Iraq with PTSD have been finding art therapy as a healing process o be very helpful," she said. "I found a a website with vets painting and sewing on their combat jackets. Men in our culture are told not to feel or talk about things. Men feel and have needs too. Therapy can be a way to explore that safely." Harkness has clients as young as age 4, and also recommends what some may find a terrifying notion, that families come in and collaborate on an art piece to Improve communication, to potentially calm the waters of competitiveness and combativeness. She said with a grin that no paint fights have broken out yet. And those pesky New Year's resolutions we make and have trouble sticking to? "I think a lot of people set their resolutions and goals too high," she warned. "Their expectations are too high. I think the first part is accepting where you are, and being compassionate and gentle with yourself and saying what's actually feasible and doable right now. You don't want to make self-care another job or work to do." Courageous Heart Healing website here.